Liz Harris - our Lady in York - has been a fan of BSH since day one almost 11 years ago and today (Feb. 4) is her birthday. In the attached photo, Liz is the stunning blonde between the guitars in the back row. It's a family photo so, as you can see, they are/were a very musical/guitar family. 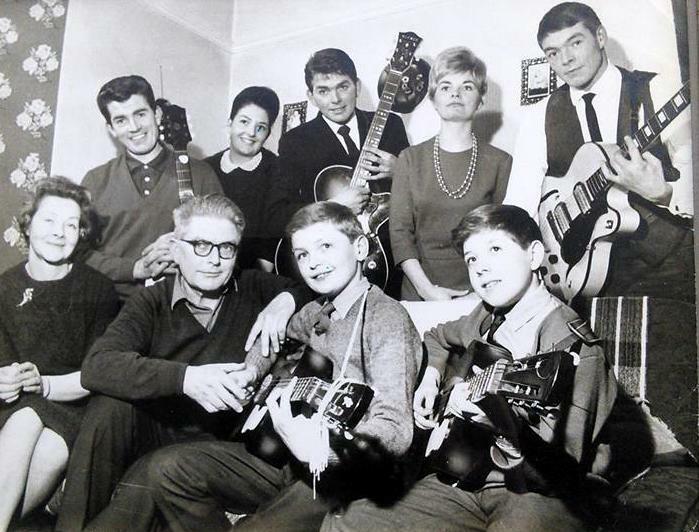 In the front row, (l-r) are her late parents - her dad, Bob Goodall, was described in Van Wilson's history of popular music in York - Rhythm and Romance - as, "being as near to Django Reinhardt as you're ever going to get" and he was a regular on the York jazz/dance band scene in the post-war years. Liz's sons, Simon (yet to be born at the time of the pic which appeared in the local press) and Kevin, also played guitar from an early age. Simon and his wife Samantha are involved in music and theatre in the Brighton area whilst Kevin and his partner Sarah are directors of DIME which has music schools in Denver and Detroit. 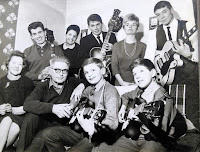 Her siblings too were all musicians, Ron, until ill-health curtailed his activities was a well-respected bass guitarist in and around North Yorkshire - ask Jeremy McMurray or John Cowan - her youngest brother, David, to the right of Kevin, took to the six strings early - he also blows a mean harp. Brother Les (back row, far right) is described by Liz as the greatest authority on Django she knows and he still practices daily. Norman, far left, who now lives in Canada began as a skiffler (the hairstyle may be a clue) and knocks out Rock Island Line as a party piece. Sister Irene, next to Norman, Liz tells me also sang around the family gigs - Fever her specialty. As for Liz herself, she loves, Sinatra, Tormé, Bublé, Barbara Cook, Sondheim and, naturally, Django. Oh thank you Lance, that is such a lovely tribute to my family, as the great Bard of Avon said " If music be the food of love, play on"
Bless you for your kind words, it means a lot to me, as does our long friendship.